Baba Ganoush is a very popular and tasty spread that can be enjoyed with veggies, sandwich or pita. 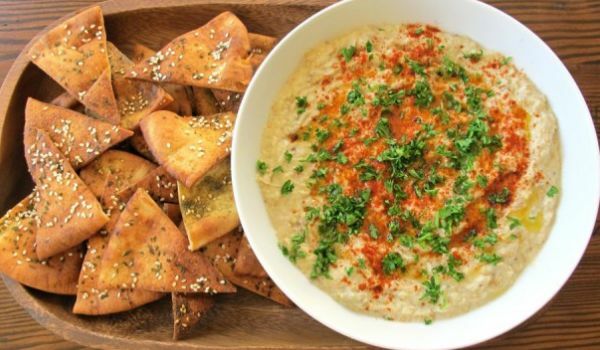 Learn how to make/prepare Baba Ganoush by following this easy recipe. Slice an eggplant in half and then roast it at 400 degree F temperature for 45 minutes, or until it is soft. When done, let it cool a bit and then scoop out the inside of eggplant. Now, blend the eggplant in the food processor, along with remaining ingredients, except oil and parsley, till it is smooth. Ppour olive oil in the mixture and blend it till it mixes well. Empty the food processor container in a medium sized bowl. Mix chopped parsley by hand. Serve it as a spread on bread.